The Community has set itself the objective of maintaining and developing an area of freedom, security and justice in which the free movement of persons is ensured. For the gradual establishment of such an area, the Community is to adopt, inter alia, measures in the field of judicial cooperation in civil matters having cross-border implications and needed for the proper functioning of the internal market. According to Article 65(c) of the Treaty, these measures are to include measures eliminating obstacles to the good functioning of civil proceedings, if necessary by promoting the compatibility of the rules on civil procedure applicable in the Member States. The European Council meeting in Tampere on 15 and 16 October 1999 invited the Council and the Commission to prepare new legislation on issues that are instrumental to smooth judicial cooperation and to enhanced access to law and specifically made reference, in that context, to orders for money payment. On 30 November 2000, the Council adopted a joint Commission and Council programme of measures for implementation of the principle of mutual recognition of decisions in civil and commercial matters (3). The programme envisages the possibility of a specific, uniform or harmonised procedure laid down within the Community to obtain a judicial decision in specific areas including that of uncontested claims. This was taken forward by the Hague Programme, adopted by the European Council on 5 November 2004, which called for work to be actively pursued on the European order for payment. The Commission adopted a Green Paper on a European order for payment procedure and on measures to simplify and speed up small claims litigation on 20 December 2002. The Green Paper launched consultations on the possible objectives and features of a uniform or harmonised European procedure for the recovery of uncontested claims. The swift and efficient recovery of outstanding debts over which no legal controversy exists is of paramount importance for economic operators in the European Union, as late payments constitute a major reason for insolvency threatening the survival of businesses, particularly small and medium-sized enterprises, and resulting in numerous job losses. All Member States are trying to tackle the issue of mass recovery of uncontested claims, in the majority of States by means of a simplified order for payment procedure, but both the content of national legislation and the performance of domestic procedures vary substantially. Furthermore, the procedures currently in existence are frequently either inadmissible or impracticable in cross-border cases. The resulting impediments to access to efficient justice in cross-border cases and the distortion of competition within the internal market due to imbalances in the functioning of procedural means afforded to creditors in different Member States necessitate Community legislation guaranteeing a level playing field for creditors and debtors throughout the European Union. The purpose of this Regulation is to simplify, speed up and reduce the costs of litigation in cross-border cases concerning uncontested pecuniary claims by creating a European order for payment procedure, and to permit the free circulation of European orders for payment throughout the Member States by laying down minimum standards, compliance with which renders unnecessary any intermediate proceedings in the Member State of enforcement prior to recognition and enforcement. The procedure established by this Regulation should serve as an additional and optional means for the claimant, who remains free to resort to a procedure provided for by national law. Accordingly, this Regulation neither replaces nor harmonises the existing mechanisms for the recovery of uncontested claims under national law. The procedure should be based, to the largest extent possible, on the use of standard forms in any communication between the court and the parties in order to facilitate its administration and enable the use of automatic data processing. When deciding which courts are to have jurisdiction to issue a European order for payment, Member States should take due account of the need to ensure access to justice. 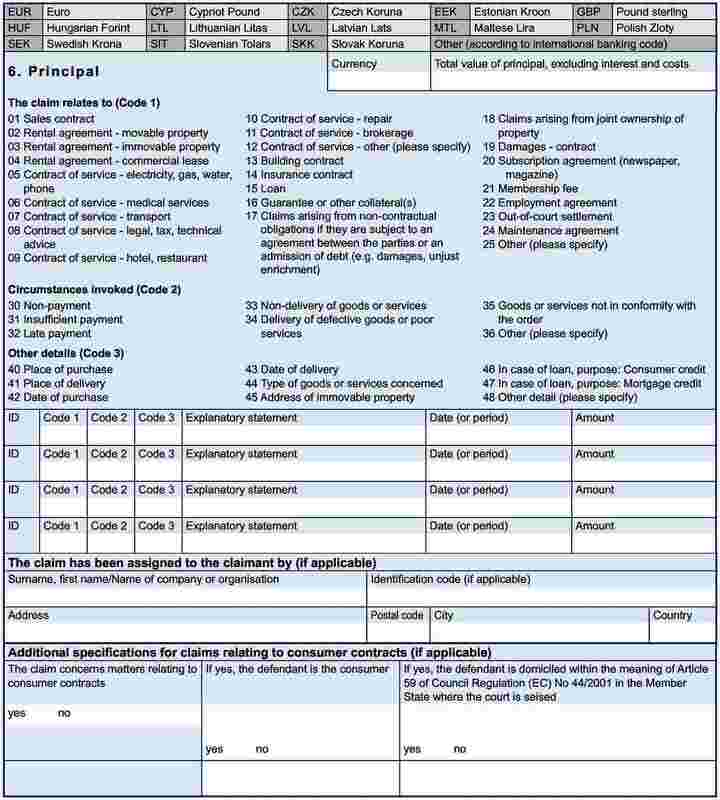 In the application for a European order for payment, the claimant should be obliged to provide information that is sufficient to clearly identify and support the claim in order to place the defendant in a position to make a well-informed choice either to oppose the claim or to leave it uncontested. In that context, it should be compulsory for the claimant to include a description of evidence supporting the claim. 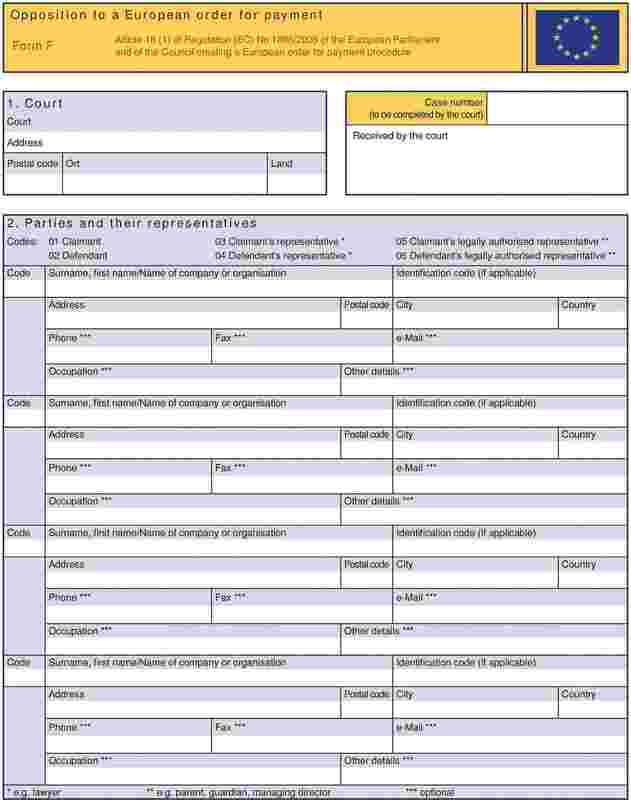 For that purpose the application form should include as exhaustive a list as possible of types of evidence that are usually produced in support of pecuniary claims. The lodging of an application for a European order for payment should entail the payment of any applicable court fees. The court should examine the application, including the issue of jurisdiction and the description of evidence, on the basis of the information provided in the application form. This would allow the court to examine prima facie the merits of the claim and inter alia to exclude clearly unfounded claims or inadmissible applications. The examination should not need to be carried out by a judge. There is to be no right of appeal against the rejection of the application. This does not preclude, however, a possible review of the decision rejecting the application at the same level of jurisdiction in accordance with national law. The European order for payment should apprise the defendant of his options to pay the amount awarded to the claimant or to send a statement of opposition within a time limit of 30 days if he wishes to contest the claim. In addition to being provided with full information concerning the claim as supplied by the claimant, the defendant should be advised of the legal significance of the European order for payment and in particular of the consequences of leaving the claim uncontested. Due to differences between Member States' rules of civil procedure and especially those governing the service of documents, it is necessary to lay down a specific and detailed definition of minimum standards that should apply in the context of the European order for payment procedure. In particular, as regards the fulfilment of those standards, any method based on legal fiction should not be considered sufficient for the service of the European order for payment. All the methods of service listed in Articles 13 and 14 are characterised by either complete certainty (Article 13) or a very high degree of likelihood (Article 14) that the document served has reached its addressee. Personal service on certain persons other than the defendant himself pursuant to Article 14(1)(a) and (b) should be deemed to meet the requirements of those provisions only if those persons actually accepted/received the European order for payment. Article 15 should apply to situations where the defendant cannot represent himself in court, as in the case of a legal person, and where a person authorised to represent him is determined by law, as well as to situations where the defendant has authorised another person, in particular a lawyer, to represent him in the specific court proceedings at issue. The defendant may submit his statement of opposition using the standard form set out in this Regulation. However, the courts should take into account any other written form of opposition if it is expressed in a clear manner. A statement of opposition filed within the time limit should terminate the European order for payment procedure and should lead to an automatic transfer of the case to ordinary civil proceedings unless the claimant has explicitly requested that the proceedings be terminated in that event. For the purposes of this Regulation the concept of ordinary civil proceedings should not necessarily be interpreted within the meaning of national law. After the expiry of the time limit for submitting the statement of opposition, in certain exceptional cases the defendant should be entitled to apply for a review of the European order for payment. Review in exceptional cases should not mean that the defendant is given a second opportunity to oppose the claim. During the review procedure the merits of the claim should not be evaluated beyond the grounds resulting from the exceptional circumstances invoked by the defendant. The other exceptional circumstances could include a situation where the European order for payment was based on false information provided in the application form. Court fees covered by Article 25 should not include for example lawyers' fees or costs of service of documents by an entity other than a court. A European order for payment issued in one Member State which has become enforceable should be regarded for the purposes of enforcement as if it had been issued in the Member State in which enforcement is sought. Mutual trust in the administration of justice in the Member States justifies the assessment by the court of one Member State that all conditions for issuing a European order for payment are fulfilled to enable the order to be enforced in all other Member States without judicial review of the proper application of minimum procedural standards in the Member State where the order is to be enforced. Without prejudice to the provisions of this Regulation, in particular the minimum standards laid down in Article 22(1) and (2) and Article 23, the procedures for the enforcement of the European order for payment should continue to be governed by national law. For the purposes of calculating time limits, Regulation (EEC, Euratom) No 1182/71 of the Council of 3 June 1971 determining the rules applicable to periods, dates and time limits (4) should apply. The defendant should be advised of this and should be informed that account will be taken of the public holidays of the Member State in which the court issuing the European order for payment is situated. Since the objective of this Regulation, namely to establish a uniform rapid and efficient mechanism for the recovery of uncontested pecuniary claims throughout the European Union, cannot be sufficiently achieved by the Member States and can therefore, by reason of the scale and effects of the Regulation, be better achieved at Community level, the Community may adopt measures in accordance with the principle of subsidiarity as set out in Article 5 of the Treaty. In accordance with the principle of proportionality as set out in that Article, this Regulation does not go beyond what is necessary in order to achieve that objective. to permit the free circulation of European orders for payment throughout the Member States by laying down minimum standards, compliance with which renders unnecessary any intermediate proceedings in the Member State of enforcement prior to recognition and enforcement. 2. This Regulation shall not prevent a claimant from pursuing a claim within the meaning of Article 4 by making use of another procedure available under the law of a Member State or under Community law. 1. This Regulation shall apply to civil and commercial matters in cross-border cases, whatever the nature of the court or tribunal. It shall not extend, in particular, to revenue, customs or administrative matters or the liability of the State for acts and omissions in the exercise of State authority (‘acta iure imperii’). they relate to liquidated debts arising from joint ownership of property. 3. In this Regulation, the term ‘Member State’ shall mean Member States with the exception of Denmark. 1. For the purposes of this Regulation, a cross-border case is one in which at least one of the parties is domiciled or habitually resident in a Member State other than the Member State of the court seised. 2. Domicile shall be determined in accordance with Articles 59 and 60 of Council Regulation (EC) No 44/2001 of 22 December 2000 on jurisdiction and the recognition and enforcement of judgments in civil and commercial matters (6). 3. The relevant moment for determining whether there is a cross-border case shall be the time when the application for a European order for payment is submitted in accordance with this Regulation. The European order for payment procedure shall be established for the collection of pecuniary claims for a specific amount that have fallen due at the time when the application for a European order for payment is submitted. ‘court of origin’ means the court which issues a European order for payment. 1. For the purposes of applying this Regulation, jurisdiction shall be determined in accordance with the relevant rules of Community law, in particular Regulation (EC) No 44/2001. 2. However, if the claim relates to a contract concluded by a person, the consumer, for a purpose which can be regarded as being outside his trade or profession, and if the defendant is the consumer, only the courts in the Member State in which the defendant is domiciled, within the meaning of Article 59 of Regulation (EC) No 44/2001, shall have jurisdiction. 1. 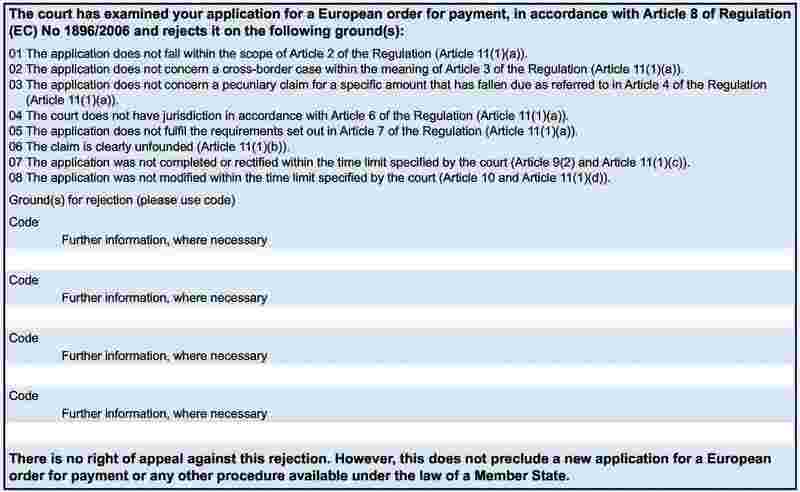 An application for a European order for payment shall be made using standard form A as set out in Annex I.
the cross-border nature of the case within the meaning of Article 3. 3. In the application, the claimant shall declare that the information provided is true to the best of his knowledge and belief and shall acknowledge that any deliberate false statement could lead to appropriate penalties under the law of the Member State of origin. 4. In an Appendix to the application the claimant may indicate to the court that he opposes a transfer to ordinary civil proceedings within the meaning of Article 17 in the event of opposition by the defendant. This does not prevent the claimant from informing the court thereof subsequently, but in any event before the order is issued. 5. 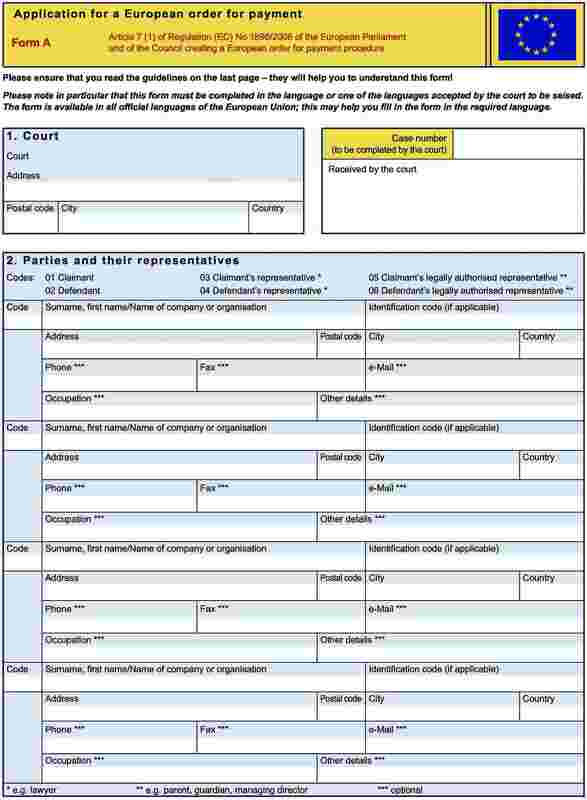 The application shall be submitted in paper form or by any other means of communication, including electronic, accepted by the Member State of origin and available to the court of origin. 6. The application shall be signed by the claimant or, where applicable, by his representative. Where the application is submitted in electronic form in accordance with paragraph 5, it shall be signed in accordance with Article 2(2) of Directive 1999/93/EC of the European Parliament and of the Council of 13 December 1999 on a Community framework for electronic signatures (7). The signature shall be recognised in the Member State of origin and may not be made subject to additional requirements. However, such electronic signature shall not be required if and to the extent that an alternative electronic communications system exists in the courts of the Member State of origin which is available to a certain group of pre-registered authenticated users and which permits the identification of those users in a secure manner. Member States shall inform the Commission of such communications systems. The court seised of an application for a European order for payment shall examine, as soon as possible and on the basis of the application form, whether the requirements set out in Articles 2, 3, 4, 6 and 7 are met and whether the claim appears to be founded. This examination may take the form of an automated procedure. 1. If the requirements set out in Article 7 are not met and unless the claim is clearly unfounded or the application is inadmissible, the court shall give the claimant the opportunity to complete or rectify the application. The court shall use standard form B as set out in Annex II. 2. Where the court requests the claimant to complete or rectify the application, it shall specify a time limit it deems appropriate in the circumstances. The court may at its discretion extend that time limit. 1. If the requirements referred to in Article 8 are met for only part of the claim, the court shall inform the claimant to that effect, using standard form C as set out in Annex III. The claimant shall be invited to accept or refuse a proposal for a European order for payment for the amount specified by the court and shall be informed of the consequences of his decision. The claimant shall reply by returning standard form C sent by the court within a time limit specified by the court in accordance with Article 9(2). 2. If the claimant accepts the court's proposal, the court shall issue a European order for payment, in accordance with Article 12, for that part of the claim accepted by the claimant. The consequences with respect to the remaining part of the initial claim shall be governed by national law. 3. 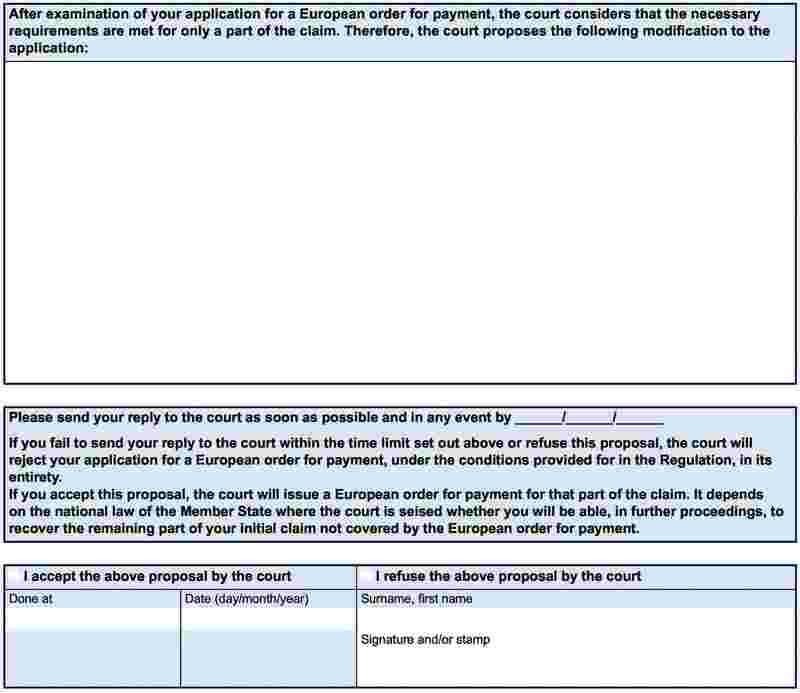 If the claimant fails to send his reply within the time limit specified by the court or refuses the court's proposal, the court shall reject the application for a European order for payment in its entirety. the claimant fails to send his reply within the time limit specified by the court or refuses the court's proposal, in accordance with Article 10. The claimant shall be informed of the grounds for the rejection by means of standard form D as set out in Annex IV. 2. There shall be no right of appeal against the rejection of the application. 3. The rejection of the application shall not prevent the claimant from pursuing the claim by means of a new application for a European order for payment or of any other procedure available under the law of a Member State. 1. 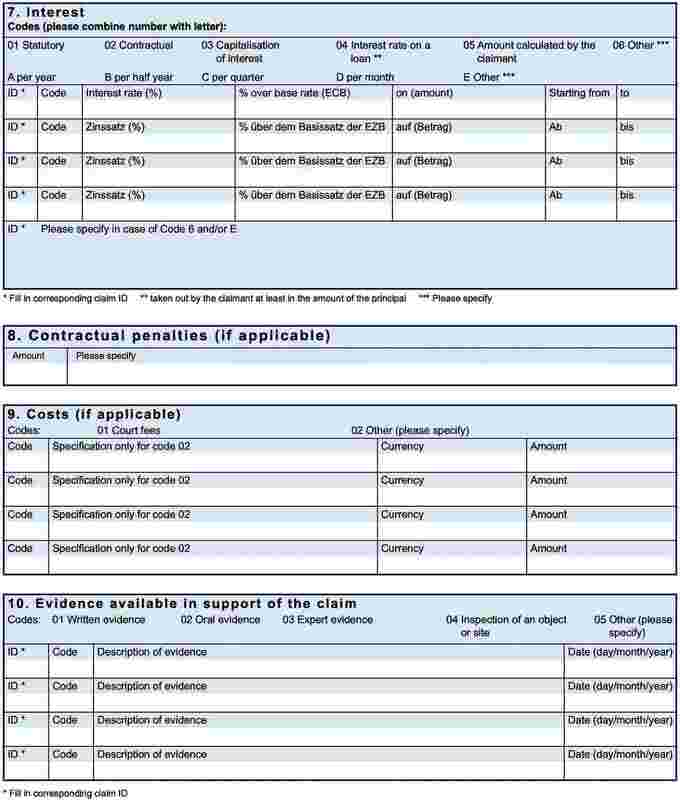 If the requirements referred to in Article 8 are met, the court shall issue, as soon as possible and normally within 30 days of the lodging of the application, a European order for payment using standard form E as set out in Annex V.
The 30-day period shall not include the time taken by the claimant to complete, rectify or modify the application. 2. 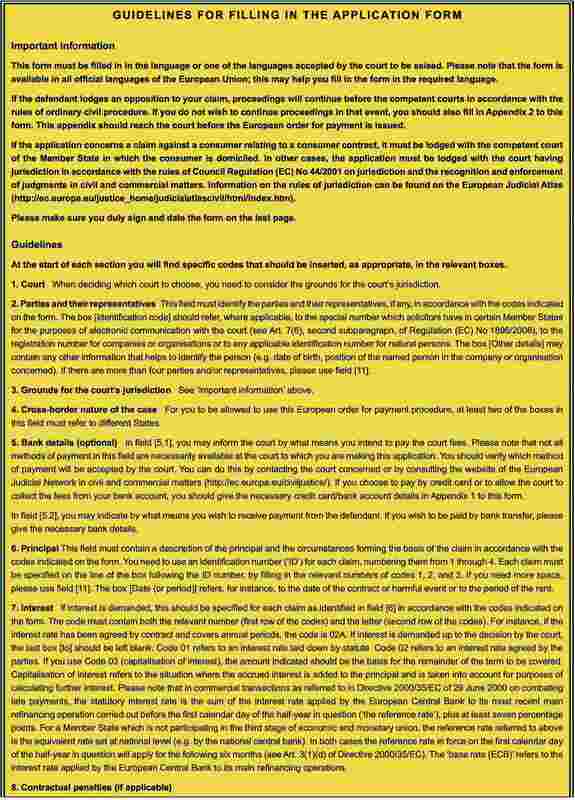 The European order for payment shall be issued together with a copy of the application form. It shall not comprise the information provided by the claimant in Appendices 1 and 2 to form A.
oppose the order by lodging with the court of origin a statement of opposition, to be sent within 30 days of service of the order on him. where a statement of opposition is lodged, the proceedings shall continue before the competent courts of the Member State of origin in accordance with the rules of ordinary civil procedure unless the claimant has explicitly requested that the proceedings be terminated in that event. 5. 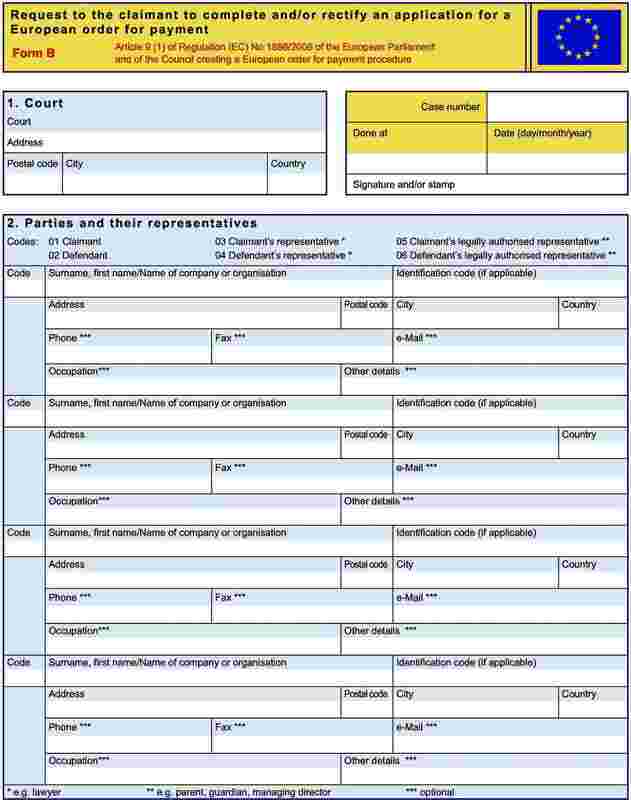 The court shall ensure that the order is served on the defendant in accordance with national law by a method that shall meet the minimum standards laid down in Articles 13, 14 and 15.
service by electronic means such as fax or e-mail, attested by an acknowledgement of receipt, including the date of receipt, which is signed and returned by the defendant. electronic means attested by an automatic confirmation of delivery, provided that the defendant has expressly accepted this method of service in advance. 2. For the purposes of this Regulation, service under paragraph 1 is not admissible if the defendant's address is not known with certainty. an acknowledgement of receipt by the person served, for the purposes of paragraphs (1)(a) and (b). Service pursuant to Articles 13 or 14 may also be effected on a defendant's representative. 1. The defendant may lodge a statement of opposition to the European order for payment with the court of origin using standard form F as set out in Annex VI, which shall be supplied to him together with the European order for payment. 2. The statement of opposition shall be sent within 30 days of service of the order on the defendant. 3. The defendant shall indicate in the statement of opposition that he contests the claim, without having to specify the reasons for this. 4. The statement of opposition shall be submitted in paper form or by any other means of communication, including electronic, accepted by the Member State of origin and available to the court of origin. 5. The statement of opposition shall be signed by the defendant or, where applicable, by his representative. Where the statement of opposition is submitted in electronic form in accordance with paragraph 4, it shall be signed in accordance with Article 2(2) of Directive 1999/93/EC. 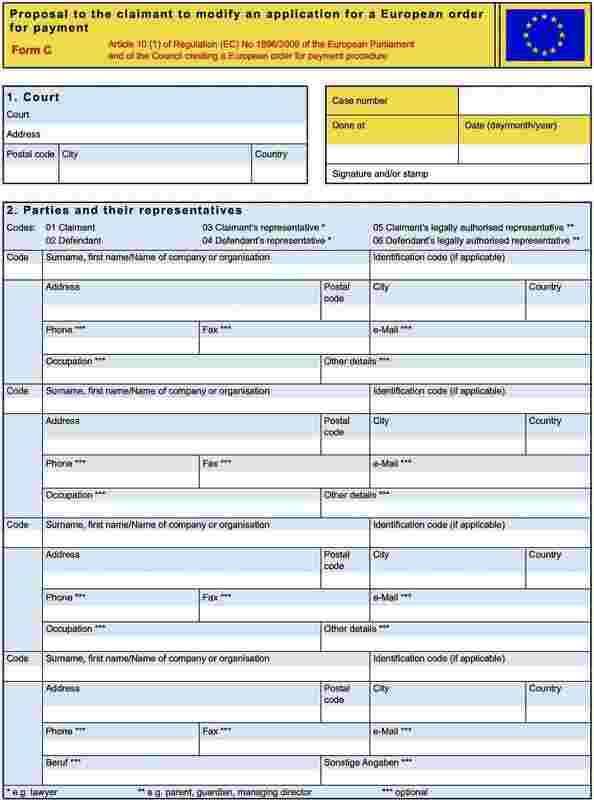 The signature shall be recognised in the Member State of origin and may not be made subject to additional requirements. 1. If a statement of opposition is entered within the time limit laid down in Article 16(2), the proceedings shall continue before the competent courts of the Member State of origin in accordance with the rules of ordinary civil procedure unless the claimant has explicitly requested that the proceedings be terminated in that event. Where the claimant has pursued his claim through the European order for payment procedure, nothing under national law shall prejudice his position in subsequent ordinary civil proceedings. 2. The transfer to ordinary civil proceedings within the meaning of paragraph 1 shall be governed by the law of the Member State of origin. 3. The claimant shall be informed whether the defendant has lodged a statement of opposition and of any transfer to ordinary civil proceedings. 1. If within the time limit laid down in Article 16(2), taking into account an appropriate period of time to allow a statement to arrive, no statement of opposition has been lodged with the court of origin, the court of origin shall without delay declare the European order for payment enforceable using standard form G as set out in Annex VII. The court shall verify the date of service. 2. Without prejudice to paragraph 1, the formal requirements for enforceability shall be governed by the law of the Member State of origin. 3. The court shall send the enforceable European order for payment to the claimant. A European order for payment which has become enforceable in the Member State of origin shall be recognised and enforced in the other Member States without the need for a declaration of enforceability and without any possibility of opposing its recognition. provided in either case that he acts promptly. 2. 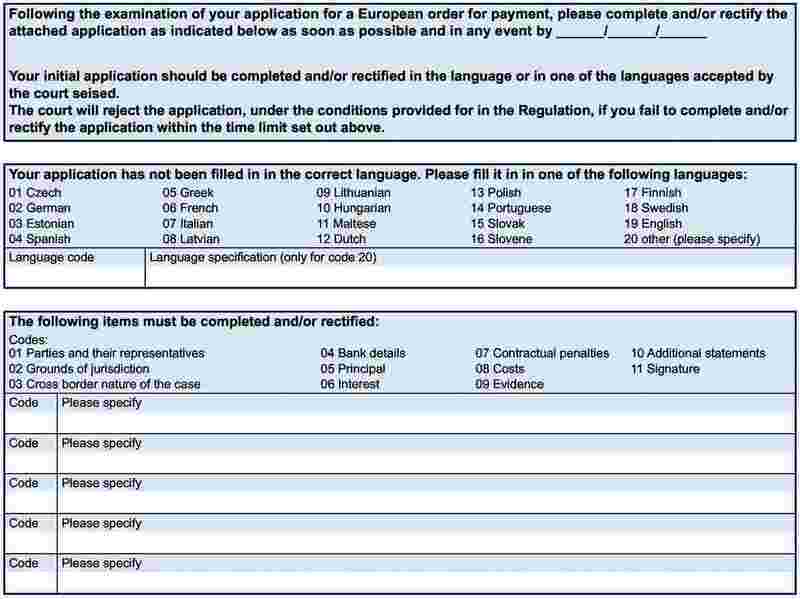 After expiry of the time limit laid down in Article 16(2) the defendant shall also be entitled to apply for a review of the European order for payment before the competent court in the Member State of origin where the order for payment was clearly wrongly issued, having regard to the requirements laid down in this Regulation, or due to other exceptional circumstances. 3. If the court rejects the defendant's application on the basis that none of the grounds for review referred to in paragraphs 1 and 2 apply, the European order for payment shall remain in force. If the court decides that the review is justified for one of the reasons laid down in paragraphs 1 and 2, the European order for payment shall be null and void. 1. Without prejudice to the provisions of this Regulation, enforcement procedures shall be governed by the law of the Member State of enforcement. A European order for payment which has become enforceable shall be enforced under the same conditions as an enforceable decision issued in the Member State of enforcement. where necessary, a translation of the European order for payment into the official language of the Member State of enforcement or, if there are several official languages in that Member State, the official language or one of the official languages of court proceedings of the place where enforcement is sought, in conformity with the law of that Member State, or into another language that the Member State of enforcement has indicated it can accept. Each Member State may indicate the official language or languages of the institutions of the European Union other than its own which it can accept for the European order for payment. The translation shall be certified by a person qualified to do so in one of the Member States. 3. 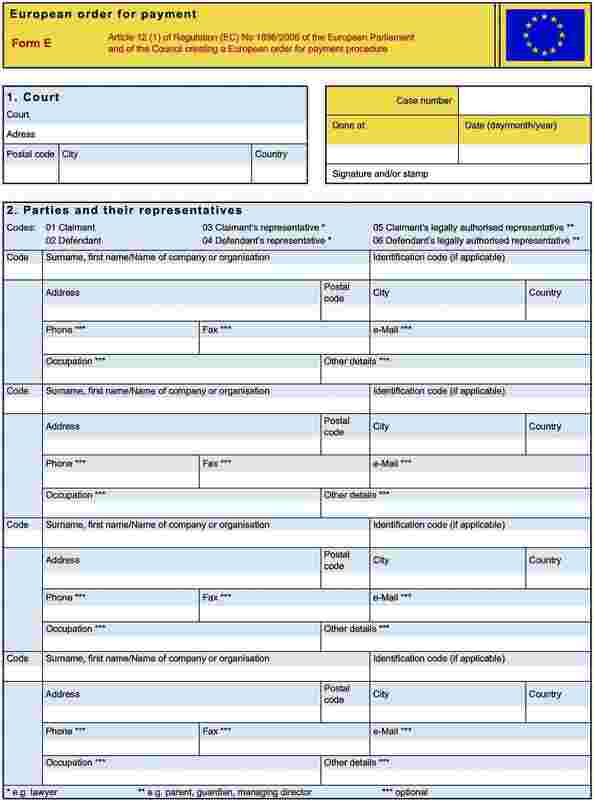 No security, bond or deposit, however described, shall be required of a claimant who in one Member State applies for enforcement of a European order for payment issued in another Member State on the ground that he is a foreign national or that he is not domiciled or resident in the Member State of enforcement. the irreconcilability could not have been raised as an objection in the court proceedings in the Member State of origin. 2. Enforcement shall, upon application, also be refused if and to the extent that the defendant has paid the claimant the amount awarded in the European order for payment. 3. Under no circumstances may the European order for payment be reviewed as to its substance in the Member State of enforcement. under exceptional circumstances, stay the enforcement proceedings. for the defendant in respect of the statement of opposition to a European order for payment. 1. 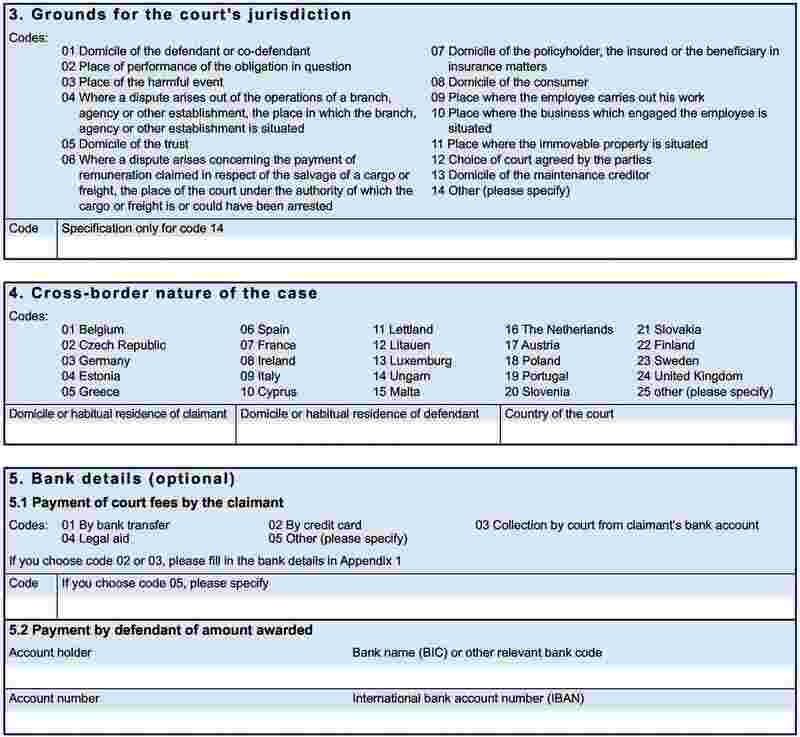 The combined court fees of a European order for payment procedure and of the ordinary civil proceedings that ensue in the event of a statement of opposition to a European order for payment in a Member State shall not exceed the court fees of ordinary civil proceedings without a preceding European order for payment procedure in that Member State. 2. For the purposes of this Regulation, court fees shall comprise fees and charges to be paid to the court, the amount of which is fixed in accordance with national law. All procedural issues not specifically dealt with in this Regulation shall be governed by national law. This Regulation shall not affect the application of Council Regulation (EC) No 1348/2000 of 29 May 2000 on the service in the Member States of judicial and extrajudicial documents in civil and commercial matters (8). in particular via the European Judicial Network in civil and commercial matters established in accordance with Council Decision 2001/470/EC (9). languages accepted pursuant to Article 21(2)(b). Member States shall apprise the Commission of any subsequent changes to this information. 2. The Commission shall make the information notified in accordance with paragraph 1 publicly available through publication in the Official Journal of the European Union and through any other appropriate means. The standard forms set out in the Annexes shall be updated or technically adjusted, ensuring full conformity with the provisions of this Regulation, in accordance with the procedure referred to in Article 31(2). 1. The Commission shall be assisted by the committee established by Article 75 of Regulation (EC) No 44/2001. 2. Where reference is made to this paragraph, Article 5a(1)-(4) and Article 7 of Decision 1999/468/EC shall apply, having regard to the provisions of Article 8 thereof. By 12 December 2013, the Commission shall present to the European Parliament, the Council and the European Economic and Social Committee a detailed report reviewing the operation of the European order for payment procedure. That report shall contain an assessment of the procedure as it has operated and an extended impact assessment for each Member State. To that end, and in order to ensure that best practice in the European Union is duly taken into account and reflects the principles of better legislation, Member States shall provide the Commission with information relating to the cross-border operation of the European order for payment. This information shall cover court fees, speed of the procedure, efficiency, ease of use and the internal payment order procedures of the Member States. The Commission's report shall be accompanied, if appropriate, by proposals for adaptation. It shall apply from 12 December 2008, with the exception of Articles 28, 29, 30 and 31 which shall apply from 12 June 2008. (1) OJ C 221, 8.9.2005, p. 77. (2) Opinion of the European Parliament of 13 December 2005 (not yet published in the Official Journal), Council Common Position of 30 June 2006 (not yet published in the Official Journal) and Position of the European Parliament of 25 October 2006. Council Decision of 11 December 2006. (4) OJ L 124, 8.6.1971, p. 1. (6) OJ L 12, 16.1.2001, p. 1. Regulation as last amended by Commission Regulation (EC) No 2245/2004 (OJ L 381, 28.12.2004, p. 10). (9) OJ L 174, 27.6.2001, p. 25.